1 vol. ; 24 pgs. : ill. ; 8.5 in. x 11.5 in. 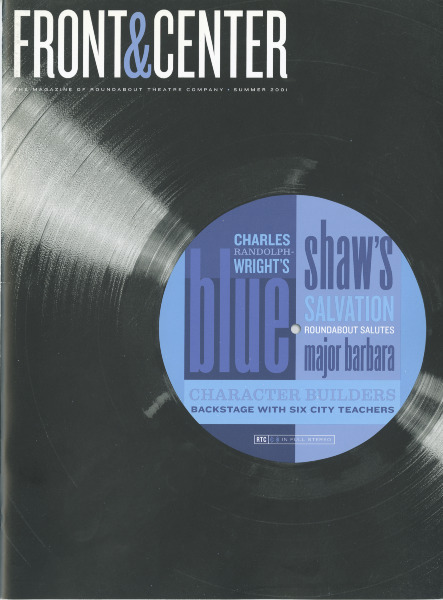 Features letter from artistic director Todd Haimes, interview with Todd Haimes and playwright Charles Randolph-Wright discussing Blue, article on African American families (Blue), article on Major Barbara and George Bernard Shaw, interview with illustrator Scott McKowen (whose artwork graced many of Roundabout's posters throughout the years), feature on teaching artists in partnership schools (Joe Thorsen, Mark Lord, Margie Castleman, Alyson Miller, Ron Saltz, Elayne Shapiro), update on productions under consideration for the 2001-2002 season.